We went to Costa Rica from Nov. 6 - 12 during almost peak season, but not quite peak season yet, so we got a better deal! We stayed at 2 different hotels: one near the volcano in Arenal and one by the beach in Punta Leona. I definitely recommend zip lining if you're visiting Costa Rica! We also did a crocodile tour on the boat ($69 per person). You watch them do a feeding, which is really neat. See my top 4 tips below if you're traveling to Costa Rica. 1. Find a Hotel that has Complimentary (free) Ziplining or Horseback Riding tour. We stayed at Punta Leona and they had a monkey canopy trail for ziplining there and that's what we did. It was complimentary with your stay and I tell you, they were high up and the real deal! We zip lined to 6 different platforms so it's not like one big long zip line. You actually get to stop and go 6 times. I'm sure the other places are great too. 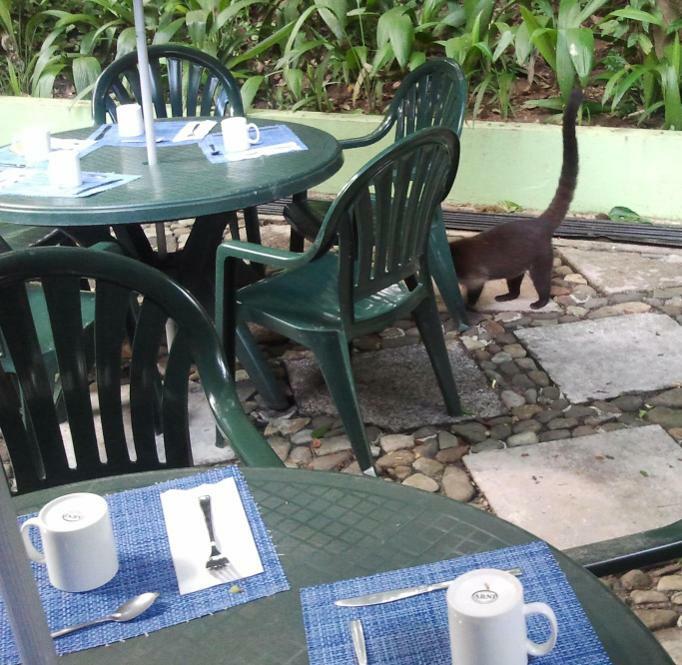 While we were having breakfast at the hotel, we would see monkeys, coati mundis and raccoons. Warning, the raccoons there are not shy. One actually came up to my husband and tugged on his pants to beg for food. That really startled both of us. We saw so many animals at the resort that we didn't feel that we needed to buy a tour to see these animals. Maybe you'll realize the same thing at the place you're staying at too after a day there. 2. Bring a raincoat. It rains a lot! It is really important to bring a raincoat! It rained nearly every day while we were there. Go figure right; since it is the 'rainforest'! We made the mistake of not bringing a raincoat because of all the rush getting to the airport. Don't bring a heavy raincoat, just those light ones are good. Bring bug spray too! Our first hotel didn't sell any so we had to borrow some. Our second hotel did sell them though but just in case yours don't sell them, it's nice to have it ahead of time. We rented a car and I think that made it easy for us to go outside of the hotel to eat at the local restaurants and explore a bit. If you are renting a car, get a GPS! Save time and maximize your experience. They put a $1000 hold on your credit card for the car rentals just in case there are damages and you also have to pay for insurance too. The roads are bumpy so a lot of the guests that we know of actually did not rent a car and just went on a tour bus since driving in a foreign country can be confusing. 4. Be prepared to reserve a bit of money to pay a traveler's tax at the airport when you leave Costa Rica. They take American dollars. Everyone paid a $28 traveler's tax when we flew back to USA from Costa Rica (just a heads up). As far as dollars versus colones (Costa Rica money), we noticed a lot of the local areas prefer colones as it's easier for them to tally up their bill without having to convert. All of the hotels and all of the tours accept credit card and cash. We exchanged some money for colones but most places use both dollars and colones. Travel safely! 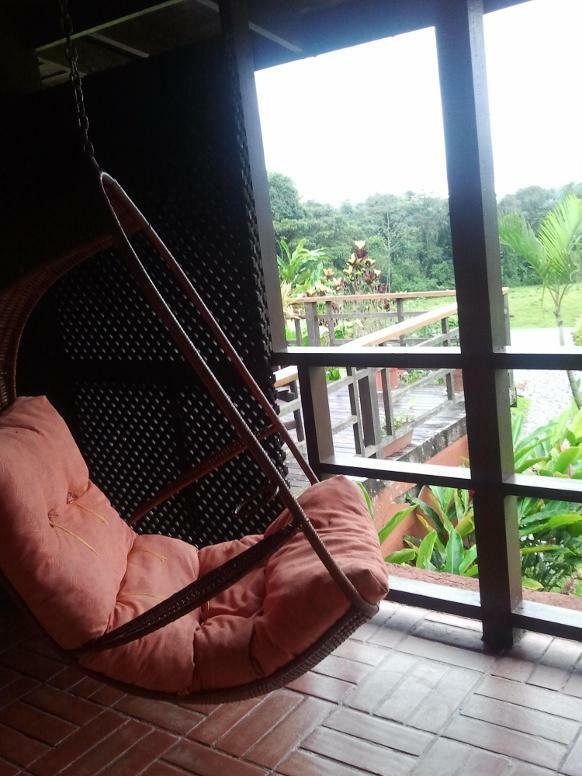 Scroll down to see more pictures of Costa Rica. Horseback riding in Costa Rica in November 2012 with our instructor, Miguel, at the Arenal Resort. It was complimentary with our stay. This was our room key below for our resort below. 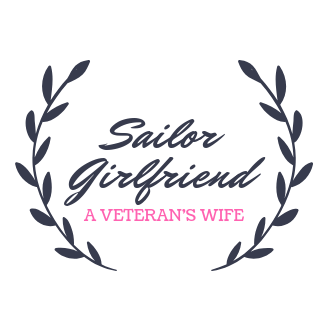 We stayed at 2 different hotels during our honeymoon. 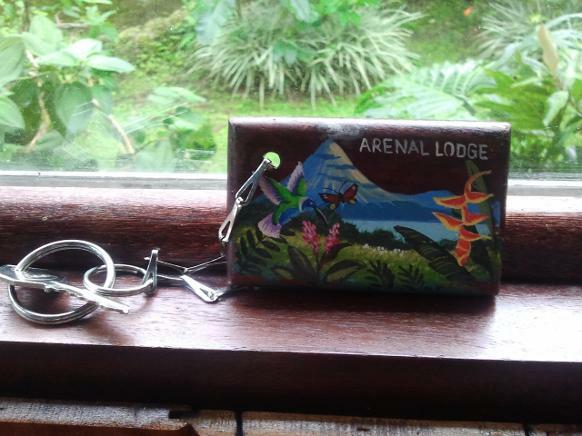 Arenal Lodge was one of them. The key chain is handpainted. They had this chair in our junior suite in our private balcony. It was very romantic. Can you see the Viper snake in the picture below? He camouflaged really well. Be careful stumbling onto these while you're in Costa Rica. 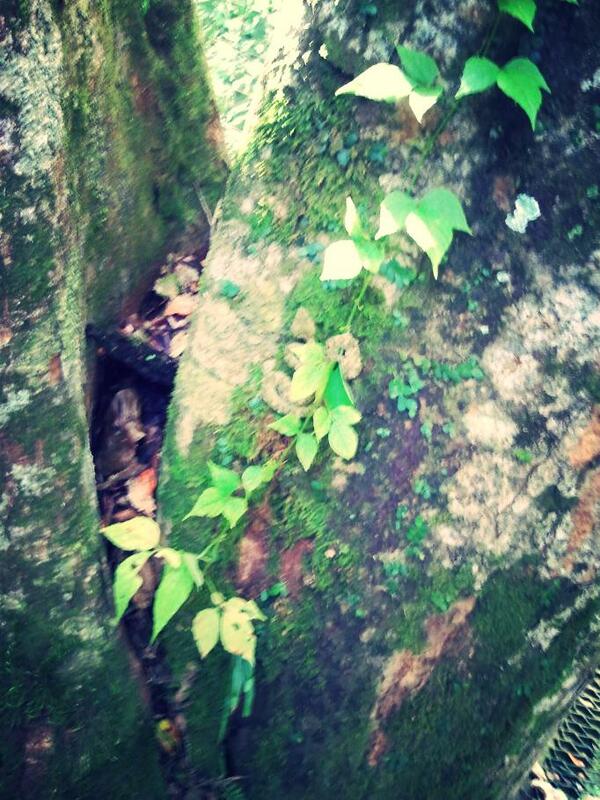 I found this one on a tree while we were ziplining to one of the platforms. 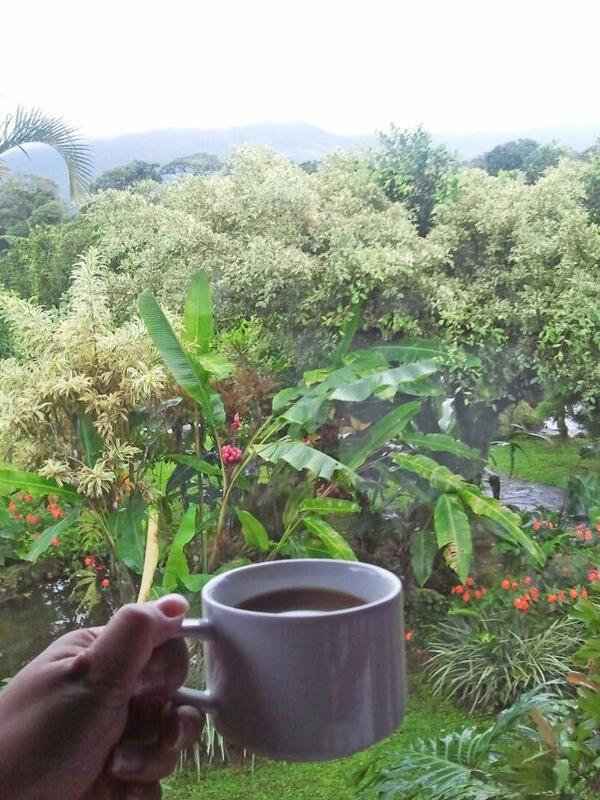 Cup of Costa Rica coffee and a great tropical view is amazing. 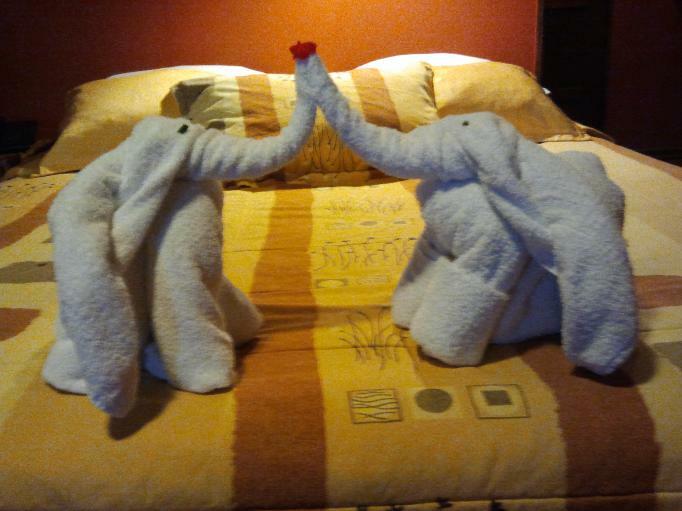 On our 2nd night of our hotel stay in Arenal, our housekeeper suprised us with two kissing elephants. 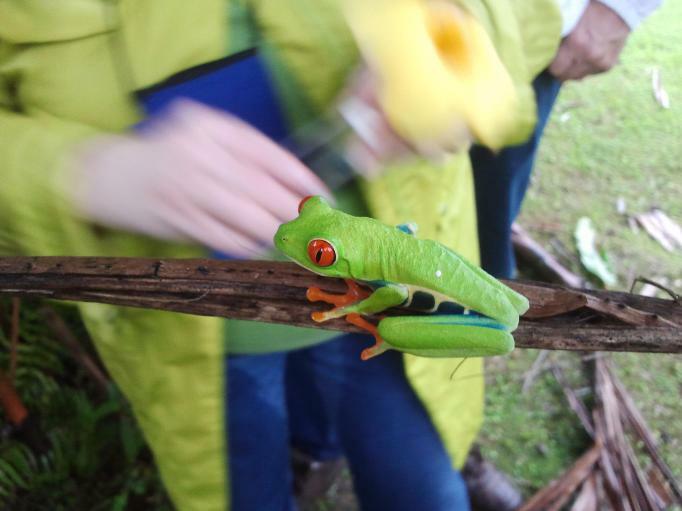 As you're walking around the resort, which of course is the rainforest in Costa Rica, you'll see beautiful frogs like this one. 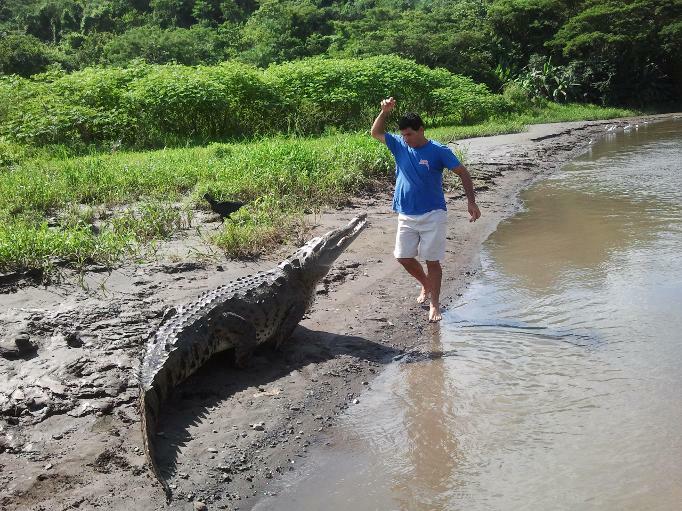 Towards the end of our honeymoon in Costa Rica, we went on a crocodile boat tour. This is actually our driver who got out of the boat to show us a feeding of a crocodile. Crazy. This creature that you see with a really long tail is a Coati Mundi. It's one of the unique animals found only in the rainforest of Costa Rica. Watch out! They are not shy at all and this one is picking up scraps while we were eating breakfast.